Why not make an original setup? Many instruments and equipments (AFM, PLL, amplifiers and etc.) are commercially available for Akiyama-Probe operation. They are very reliable and highly recommended to use. commercial PLL without any major modification of the setup. 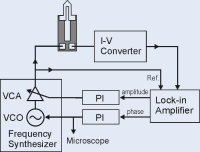 One can make a high resolution “self-oscillation + PLL” setup with two standard laboratory instruments (lock-in amplifier and frequency synthesizer) and a very simple analog circuit. The analog circuit with a few OP-amps forms a proportional-integral gain controller.